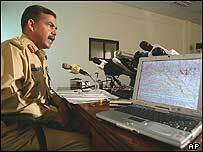 Tribal leader Nek Mohammed has been killed by the Pakistani military in an overnight raid. 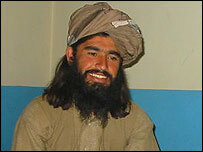 Twice this week, the BBC's Imtiaz Ali interviewed the targeted militant. Mohammed spoke to our correspondent by telephone from an undisclosed location. Q: It is said that you are a trained fighter because you have taken part in the Afghan wars. Yes of course, I have spent a lot of time with the Taleban in Afghanistan. I went there soon after the completion of my religious education here. I fought alongside the Taleban against the Northern Alliance and then also against US aggression. I was based in Bagram at the time of the US invasion of Afghanistan. Thousands of tribesmen took part in the Afghan jihad. Whenever foreign forces have committed aggression against Afghanistan, tribal people have always been at the forefront in support of their Afghan brethren against foreign invaders. Q: The Pakistani government suspects you have given shelter to foreign elements who are believed to be al-Qaeda members. That is totally baseless. During the Afghan jihad, scores of mujahideen from around the Muslim world came to Afghanistan to help Afghans in their holy war against the Russian aggression. Since that time these people have been living in Afghanistan as well as in tribal and some other urban parts of Pakistan. Many of them have been living in tribal areas for more than 15 years. They married locally, have built their own houses. Now under the pressure of the United States, Pakistan has launched its operation in South Waziristan against what they call al-Qaeda suspects. It is totally wrong that al-Qaeda members are hiding here. Those foreigners who are living here are not terrorists - rather they are mujahideen who took part in the Afghan jihad. Q: Do you admit the presence of foreign people in Waziristan? I admit that more than three million Afghan refugees migrated to Pakistan in the wake of Russian aggression against Afghanistan. Among them people of various races are included, like Uzbeks, Tajiks, Turkmens, Pashtuns and Hazaras. Q: But the Pakistani government is talking about suspected al-Qaeda fighters who are responsible for cross-border attacks on US forces in Afghanistan and also terrorist activities in Pakistan. So far, the Pakistani army has conducted five military operation in various parts of South Waziristan on the excuse of hunting down al-Qaeda fugitives but so far they have bitterly failed to capture a single member of al-Qaeda. It shows the government is doing it just for the pleasure of the United States. As far as the charges of cross-border terrorism are concerned, no-one so far has proved that Waziristan's soil is being used for attacks on US forces on the other side of the border. There are frequent attacks on US forces near border areas but then US forces are also under attack in other provinces of Afghanistan and no-one can stop these attacks. Q: President Pervez Musharraf and other government officials have claimed the presence of al-Qaeda No 2, Ayman al-Zawahri, and Uzbek militant Tahir Yaldeshive. These are no more than rumours continuously being churned out by the Western media. I don't think that such high-profile people can hide here. Q: The government offered you an amnesty if you helped register foreign fighters but say you violated the agreement. What happened? The registration of foreign elements was not part of the agreement. I never agreed to this. I announced loyalty with the government of Pakistan and committed that I and my colleagues would not do anything harmful to the interests of Pakistan. However, the government violated the agreement and now we will teach them a lesson. Q: Then why did you initially surrender to the government under the agreement? I did not surrender to the government. That is totally wrong. Surrender means when you give up your mission and everything and this is not the case. I stand by my point of view and will fight till the end. Q: It is said you have received monetary benefits from foreign people who are living in South Waziristan. History is evident to the fact that tribal people have never accepted any monetary benefits from foreigners nor have they accepted the rule of the outsider. It is not a matter of money but it is a matter of faith. Q: You mean you sheltered foreign elements on the basis of Islamic ideology? It is crystal clear that these holy warriors were brought here by the successive regimes in Pakistan. Now it is not a matter of al-Qaeda, but it is a question of Islam. Tribesmen are pure Muslims and that is why they are helping their mujahideen brothers. Q: The government wants to once again start the political process to solve the controversy of foreign elements. Would you talk to the government about this? No. In no way. I totally reject this process. The government has started fresh military operations and we will resist them and we will continue our struggle till achieving our goal. Q: What is your goal? It is very clear. We want to eradicate the US-installed puppet governments in Pakistan and Afghanistan. Once we overthrow them, then there will be peace and no-one will be able to harm Muslims.